This Model Framework covers Financial Products for Corporates with unspecified use of funds, i.e. where the funds raised or guarantees issued are used at the Corporate’s discretion, without any specified use. For example: General corporate purpose (GCP) Loans/Overdraft, Corporate Bonds with GCP use of proceeds, Equity (primary & secondary issuance), Off-balance sheet corporate products (e.g. guarantees not related to a specific asset). 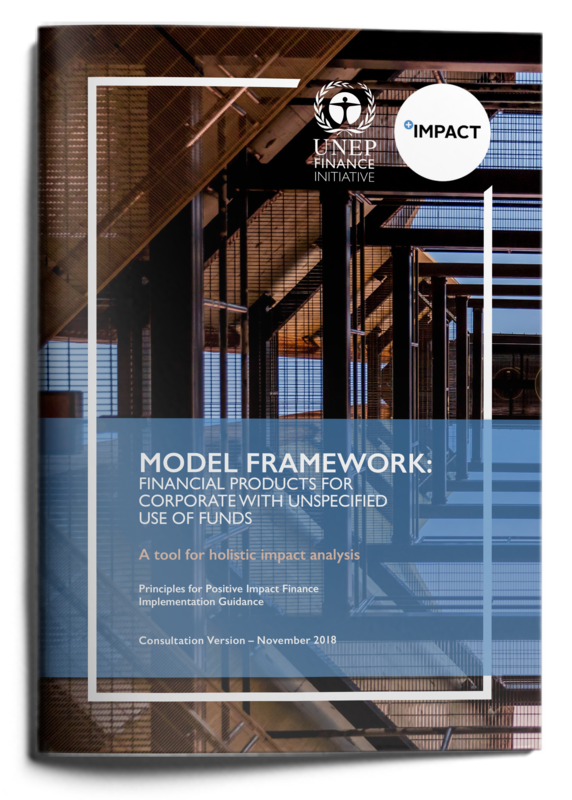 The Principles for Positive Impact Finance require appropriate frameworks to implement the holistic impact analysis and management which is needed for financial institutions to deliver PI-aligned financial products and services. Financial institutions or intermediaries seeking to deliver PI financial products. The PI Model Frameworks will enable them to develop appropriate frameworks or adapt their existing frameworks to serve a number of purposes: for decision-making (i.e. on financing/investments); for the development of PI financial products, or for on-going analysis/monitoring of portfolios. Auditors, analysts and other third parties or stakeholders called on to verify and/or provide opinions on the PI nature of financial products. The Models are not set in stone. They are designed as live tools to be trialled and tested for ongoing refinement and update over time. Financial institutions are invited to create their own Framework, using this Model as guidance, and to provide feedback to the Secretariat of the PI Initiative on any practical issues encountered. This document was prepared by the Positive Impact Initiative thanks to the generous support of the European Commission.